SAS Enterprise Miner has been a leader in data mining and modeling for over 20 years. The system offers over 80 different nodes that help users analyze, score and model their data. With a wide range of functionalities, there can be a number of different ways to produce the results you want. At SAS® Global Forum 2018, Principal Systems Engineer Melodie Rush spoke about her experience with SAS® Enterprise Miner , and compiled a list of hints that she believe will help users of all levels. This article previews her full presentation, Top 10 Tips for SAS Enterprise Miner Based on 20 Years’ Experience. The paper includes images and further details of each of the tips noted below; I’d encourage you to check it out to learn more. If you struggle finding the node that best fits what you need, there’s a system that can simplify it. Nodes are organized by Sample, Explore, Modify, Model, and Assess. Find which of these best describes what you are trying to do, and scroll across each node alphabetically for a description. Highlight process flow by dragging your mouse across, right-click or CTRL+C, and Paste or CTRL+V where you want to insert process flow. There’s a new tab, HPDM (High-Performance Data Mining), which contains several new nodes that cover data mining and machine learning algorithms. There are two new nodes under Utility that incorporate Open Source and SAS Viya. The Open Source Integration node allows you to use R language code in SAS Enterprise Miner diagrams. A SAS Viya Code node now incorporates code that will be used in SAS Viya and CAS, and algorithms from SAS Visual Data Mining and Machine Learning. To save and share your results, there are now the Register Model and Save Data nodes under Utility. You can now register models to the SAS Metadata Server to score or compare easily. 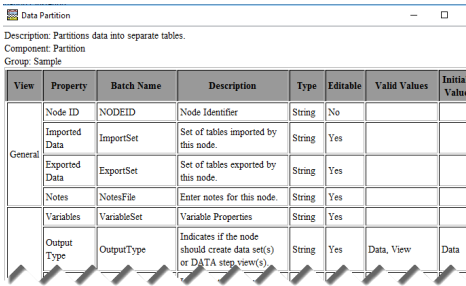 A Save Data node lets you save training, validation, test, score, or transaction data as SAS, JMP, Excel, CSV or tab-delimited files. The reporter node under Utility allows you to easily document your Enterprise Miner process flow diagrams. A .pdf or .rtf is created with an image of the process flow. The Metadata node, on the Utility tab, allows you to change metadata information and values in your diagram. You also can capture settings to then apply to data in another diagram. A scorecard emphasizes what variables and values from your model are important. Values are reported on a 0 to 1,000 scale, with the higher being more likely the event you’re measuring occurs. To do this, have the Reporter node follow a Score node, and then change the Nodes property to Summary under Reporter node properties. 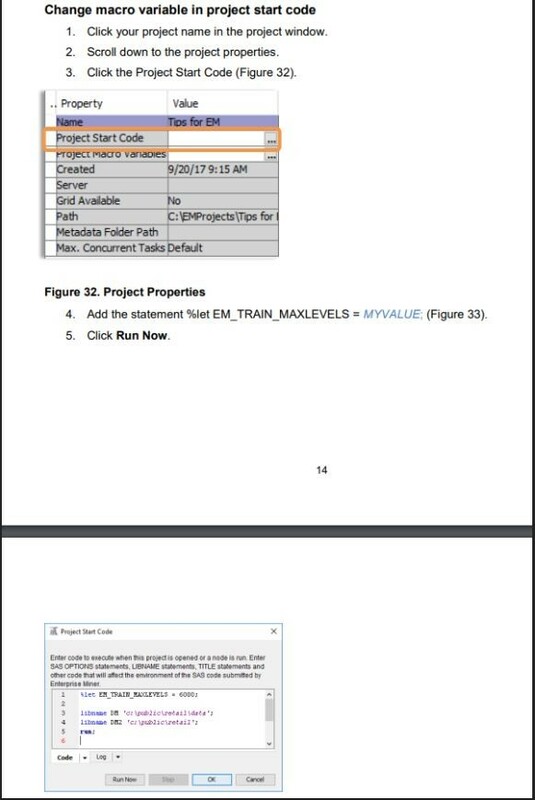 or change the macro value in project start code. Tip 9: Which variable selection method should I use? Instead of choosing just one variable selection method, you can combine different ones such as Decision Trees, Forward, Chi-Square, and others. The results can be combined using different selection properties, such as None (no changes made from original metadata), Any (reject a variable if any previous variable selection nodes reject it), All (reject a variable if all of the previous variable selection nodes reject it), and Majority (reject a variable if the majority of the variable selection nodes reject it). Decision trees can be produced to interpret networks, by changing the Prediction variable to be your Target and the Target variable to be rejected. With so many options to create models that best suit your preferences, these tips will help sharpen your focus and allow you to use SAS Enterprise Miner more efficiently and effectively. This presentation was one in a series of talks on Enterprise Miner tool presented at SAS® Global Forum 2018. Fei Wang and John Amrhein, McDougall Scientific Ltd.
Top 10 tips for SAS Enterprise Miner based on 20 years’ experience was published on SAS Users. Technology that gets the most from the Cloud Are you developing foolproof solutions?